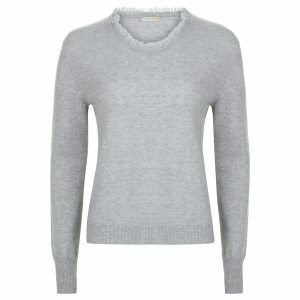 Flannel Grey Shaped Cut Cashmere Sweater with Leather Trim A twist on wardrobe staples through clever use of detail and a flattering shape; that is what we believe in here at London W11. The shaped sweater has been a staple in our cashmere collection since 2006 and each season we modernise, tweak it and add new twists which will never go out of fashion. This style has a feminine form by fitting closely on the bust and waist. The neckline is a flattering v-neck trimmed with leather to give it an urban modern edge. The ever classy flannel grey was chosen for this cashmere sweater as it brings out the best of luxurious Italian cashmere yarn and the fine leather trimming used for this style. It is the first time that we have worked with leather trimming, but we here at London W11 are convinced that this cashmere sweater will become a wardrobe staple. Wear this cashmere item with black trousers for a chic urban look or with your favorite denims for a casual but effortless chic look. We focus on providing a great service to you as much as we focus on the quality of our products. 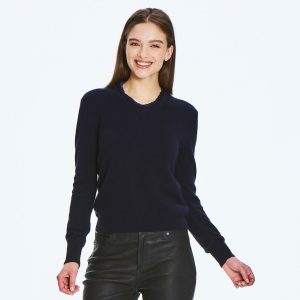 This 100% Italian cashmere sweater is delivered to your doorstep for free within the EU and to the USA/Canada, wrapped in our signature London W11 gift box.on.